Any physical object of value in terms of its cost, function, and overall impact it can have on your customer's business is an Asset. Owing to its importance, an asset requires timely repair and recurrent servicing throughout its lifecycle; from its commission to its disposal. Whether installed standalone or contained within another asset in a nested setup, assets can spread across multiple sites over several regions, and may possibly move across sites with time. However complicated be the asset landscape, you will be able to mirror their real-world associations in Loc8 by grouping assets as per their types, organising them in levels of hierarchy with respect to their latest site and parent asset, and capturing a thorough list of asset attributes that will enable you to take informed decisions on asset maintainability and operations. Find links to create an asset under the section on Asset Structure further down in this article. Any specific location that is a spot for carrying out urgent work or regular maintenance to prevent unexpected damage to its premises as well as to the assets contained within it is recognised as a Site. In Loc8, you can turn a customer location into a site by saving the location, so that the geographical address of the location gets associated with the site. Further more, it is possible that you have multiple sites at the same physical address. An asset type in Loc8 goes by its literal meaning i.e. the generic category of a particular asset. For example, in an office environment, a meeting room, storage room, file room etc. can be classified under the generic asset type Room. Though the basic attributes such as asset name and asset ID for all assets remain the same, you can add a whole set of additional parameters, called custom parameters, to capture and display other important attributes, and use them to make appropriate decisions on those assets. In every industry, assets exist in hierarchy that naturally enforces relationship between the highest level of physical object with its subordinate components, and it is quite easy to replicate an asset hierarchy in Loc8 (a representation shown below). After identifying the asset types and arranging them in a nested layout (also called as a parent-child layout), every new asset created in Loc8 automatically follows the hierarchy and helps you gain reliability, maintainability and traceability across large number and wide variety of assets. Attributes of the asset can be perfectly translated into individual custom parameters - be it a date and time of a specific event, data that must be entered in simple text, figures with units, time period or duration, true/false statements, a dropdown list of multiple choices, additional contact person (other than the site contact and asset maintainer), reference to another site or asset, website URL, monetary details or any attachment - to allow you to eventually inspect all attributes of the asset at a glance. Related custom parameters are bundled into a data group to create logical grouping when viewing and editing asset details. Relevant data groups are added to those asset types which require the bundle of associated custom parameters to describe their new assets. Different asset types are created under a parent asset type to form the hierarchy such that they automatically inherit their parent's data groups, which of course can be removed, and new ones be added as necessary. New assets of a well-defined asset type display the default fields as well as the new fields as per the custom parameters that cascade down from the related data groups that were associated with its asset type. 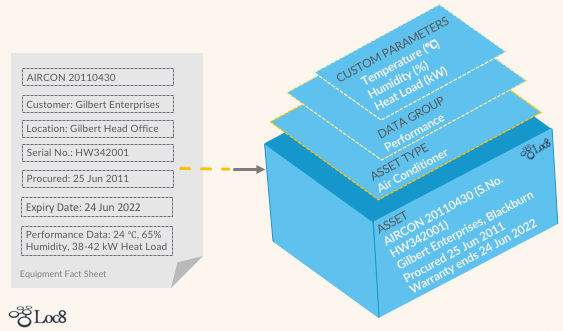 The example below shows how an equipment fact sheet is converted into asset structure in Loc8, with default and additional attributes - temperature, humidity and heat load - to completely describe the asset. Timely maintenance of assets helps you achieve appropriate asset conditions over their projected lifetime. Tasks that must be performed on assets to help retain their desired service levels become part of the maintenance schedule, while the entire program of activities required to achieve specified levels of availability and functionality of all assets form your maintenance plan in Loc8. Maintenance schedule defines the frequency at which planned jobs are automatically created for a specific set of asset types with the necessary tasks and they kick off when the maintenance schedule is activated for the sites containing those asset types. 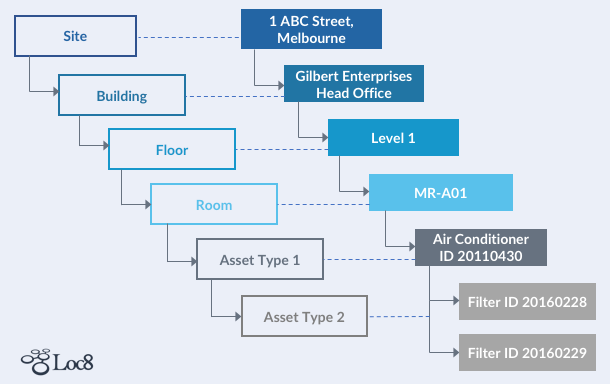 Analyse the maintenance requirements of your customer's assets and draft your maintenance plan, as shown in the example below, and then set it up in Loc8. 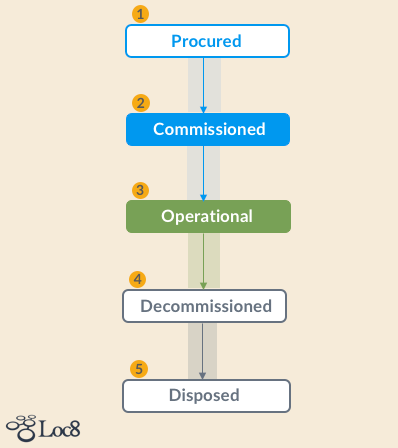 Once you have your maintenance plan in Loc8, it will take care of creating standardised schedules applicable to one or many different sites, on all or selected assets, thereby driving consistency and assuredness in the works to be performed. After a schedule is activated for a site, you can view the planned job events, per site or per asset, and choose to move or skip each event as necessary. See the step-by-step instructions on how to Set up your Maintenance Plan.